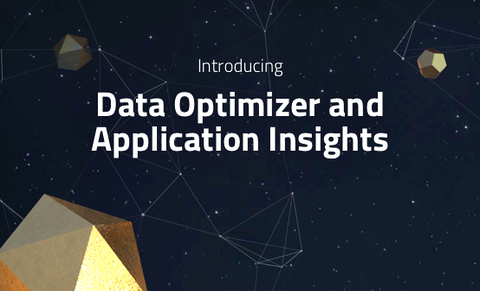 This November, we released the Data Optimizer — a cost reduction and optimization tool that helps organizations break away from existing pricing paradigms in the log analysis industry by giving them the flexibility to decide what data is important and needs retaining, how long to retain it for, and at what granularity. 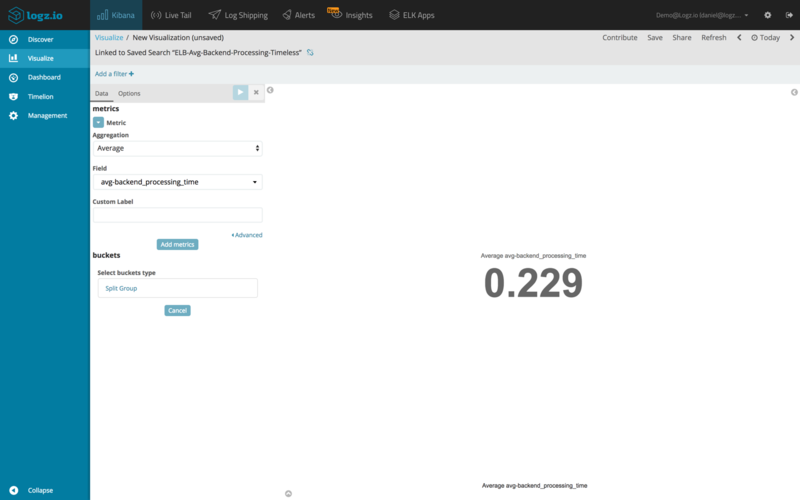 Users can now store key metrics and important data in Timeless Accounts using what we call Optimizers — aggregation rules that summarize the data, reducing the original log size, and push it into these accounts. In this article, I’m going to show you a real-life example of how the Data Optimizer can be used to reduce costs. 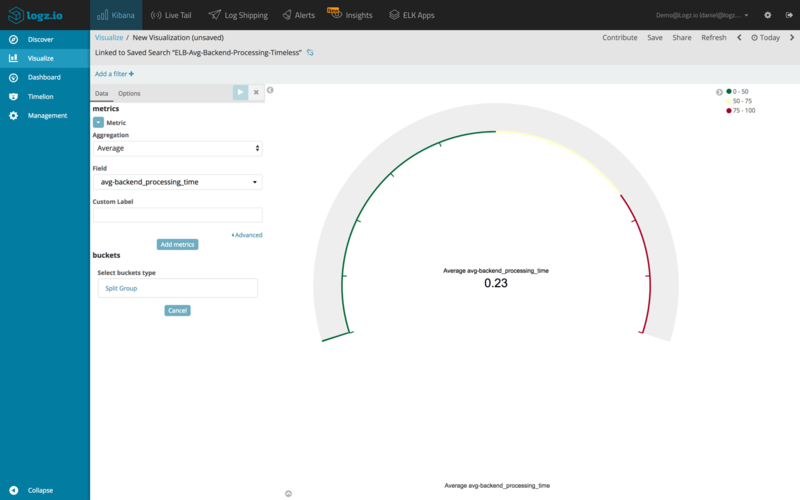 The scenario described is focused on analyzing Amazon Elastic Load Balancers (ELB) access logs, but it’s up to you guys to imagine applying the same workflow in your environments. There are a variety of different use cases for this data – troubleshooting and forensics, security, monitoring, and so forth. What is crucial to understand is that each use case necessitates a different retention model. 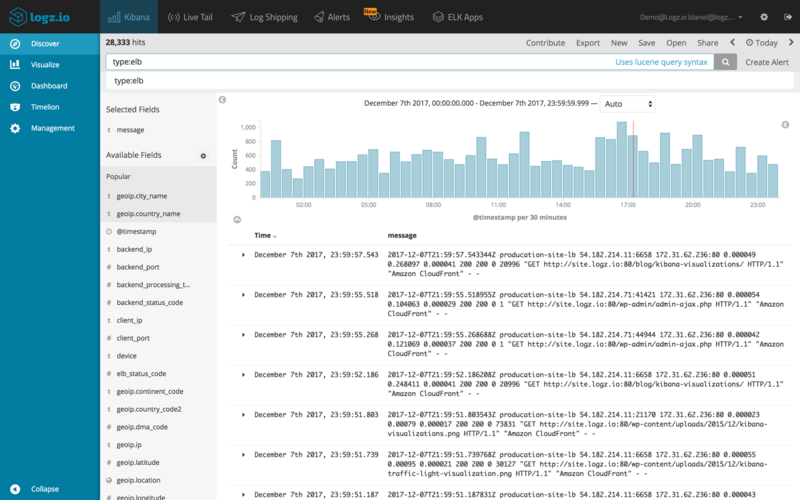 If it’s troubleshooting, you will most likely require all the logs, in their original format, but for a relatively limited retention period (e.g. 3-5 days). But say you want to measure the operational health of your ELBs over time? You would need longer retention — a year, or even longer. Storing all your ELB access logs, with year-long retention, would cost a fortune. Let’s see how this is done with the Data Optimizer. 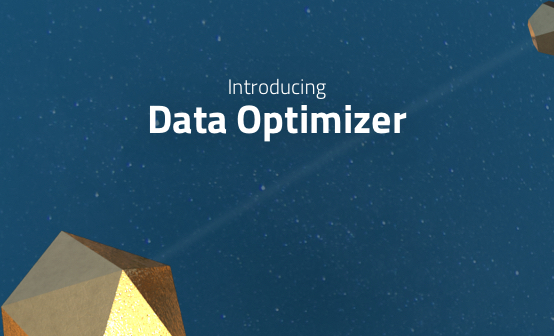 The Data Optimizer is comprised of two main components – Timeless Accounts, which is where the important data we want to retain over time is stored and indexed, and Optimizers – aggregation rules that summarize our logs and push them into the Timeless Accounts. In the section that opens up, we will enter a new name for the account (ELB metrics) and the data volume that we want to allocate to the account (10 GB). We will also select the sub accounts we want to give read and write permissions to. To push data into a Timeless Account, we will use what is called Optimizers. 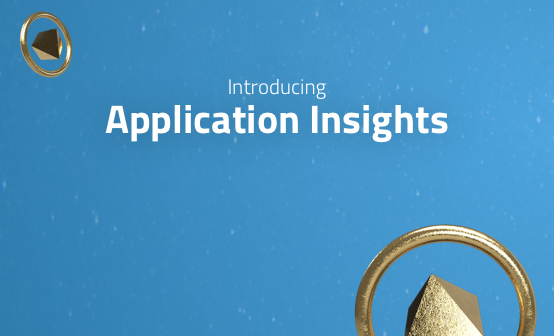 Optimizers are rules that we define that tell Logz.io exactly what log data to aggregate, how to aggregate it, at what interval and to what Timeless Account. 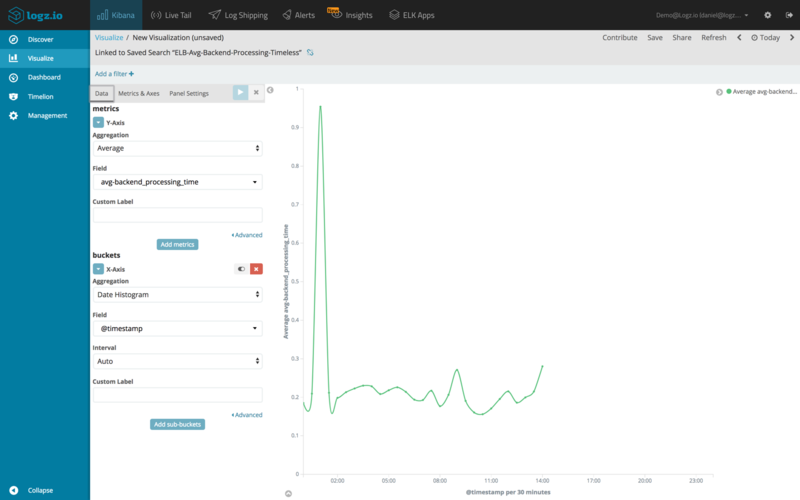 We’ll start, as usual, in the Discover tab in Kibana, where we will first enter a query searching for our ELB access logs. Opening up one of the logs, we can see a long list of the different fields available for analysis. But what interests us, for the purpose of analyzing the performance of our ELB instances, is one specific field – the backend_processing_time field. It makes no sense retaining all of our logs. Instead, what we’re going to do is create a new Optimizer that will summarize the processing time metric and push the results into our new Timeless Account for extended retention. To do this, we’re going to hit the Create Alert button, in the top-right corner of the UI. Next, in the Definitions section, I’m going to enter a name (ELB Backend Processing Time – Avg) for the new Optimizer. 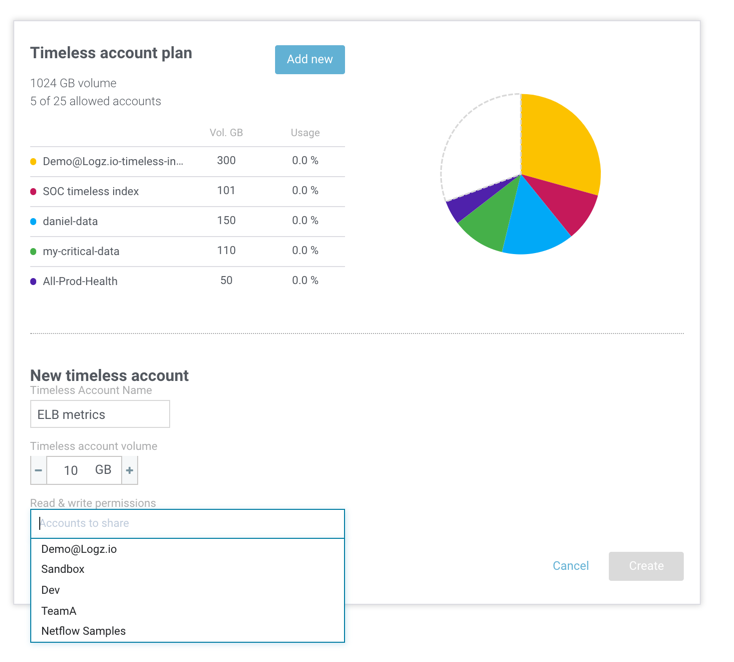 In the Action section, I’m going to select Optimizer, and then select the new Timeless Account we created. The Trigger section is where we define what kind of summary action to perform on the data. In our case, we are going to ask our Optimizer to save an average of the backend_processing_time field, every 10 minutes. 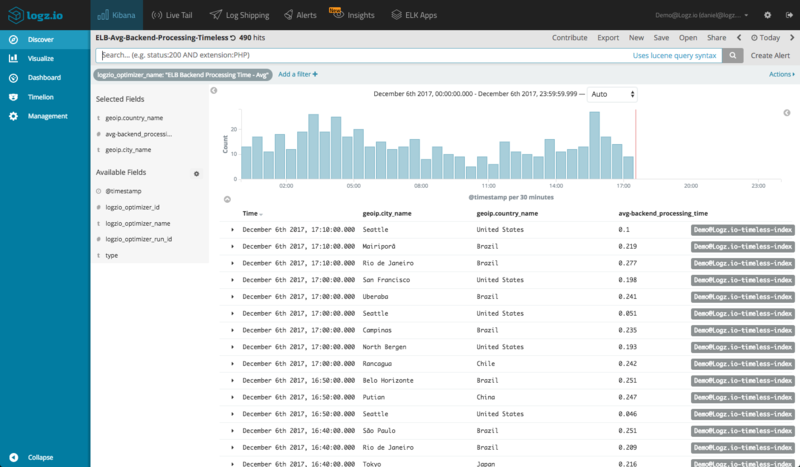 Our search results display the summarized ELB access log, as we defined in our Optimizer, the only fields being indexed in the selected Timeless Account – geoip.country_name and geoip.city_name. The Logz.io Data Optimizer gives users the flexibility to decide what data is important enough to retain for an extended period of time, decide how long they want to retain it for and at what granularity.